Lecturer John Skardon (right) presented the Second Place Award to Caitlin Deigel for her non-profit CareCuts, an online voucher-dissemination program for homeless shelter residents to use for haircuts and styles at participating local hair salons and barber shops. Alum and sponsor Marcelo Siero (left) presented the Third Place Award to Justin Blair, Sukhmeet Singh, and Asher Gardner for Code Naturally, a Microsoft Surface application for recognizing handwriting, compiling code, and executing it on the right half of the Surface screen. 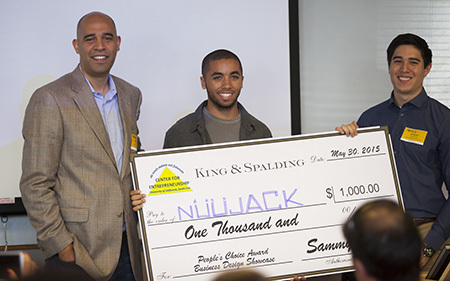 Sponsor Stephen Abreu (left) presented the People's Choice Award to Spencer Butterfield and Zach Boelsterli for their NuuJack universal headphone jack. 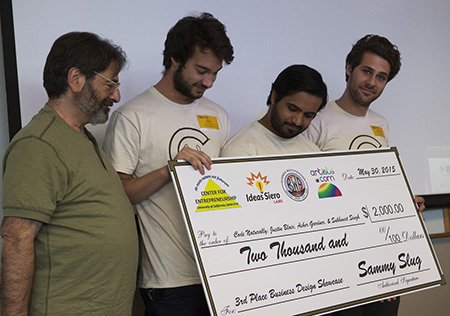 The UC Santa Cruz Center for Entrepreneurship's third annual Business Design Showcase took place on Saturday, May 30, at the UCSC Silicon Valley Center in Santa Clara. Student teams pitched their business concepts in an interactive format to Silicon Valley and Santa Cruz business leaders, entrepreneurs, faculty, and alumni. Prior to the event, entrepreneur judges had heard the business pitches of all student contestants and decided on the top three winners. The afternoon began with an hour of networking, as attendees including VIP corporate guests visited the 19 student businesses on display to hear the student entrepreneurs' business pitches. Guests were allotted "slug bucks" with which to "seed fund" their favorite business plans, and the team receiving the most slug bucks won the People's Choice Award of $1,000. 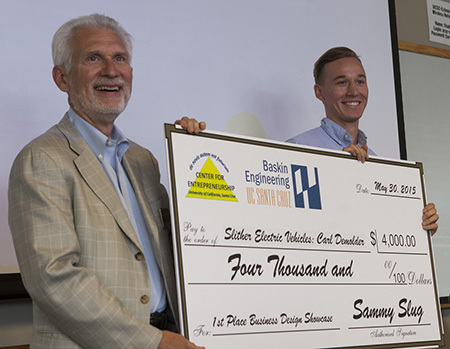 First Place ($4,000): Slithr Electric Vehicles by Carl Demolder (B.S. electrical engineering, 2016). The first place award was sponsored by the Baskin School of Engineering Dean's Fund, courtesy of Dean Joseph Konopelski, who was on hand to present the first-place check to Demolder. Slithr Electric Vehicles uses patent-pending technology in its electric-powered, portable yet powerful longboards. Slithr's unique base unit adapts to any longboard deck, and the user may customize for height, riding ability, and style. Slithr also offers patented Shark Wheels with a third the friction of standard wheels. Riders control speed, acceleration, and braking with a handheld device, wireless app on a smart phone, or Myo armband. Second Place ($3,000): CareCuts by Caitlin Deigel (B.A. business management economics, 2015). 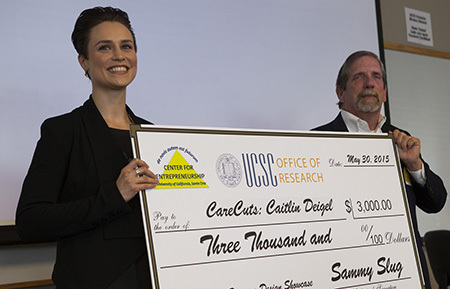 The second place award was sponsored by the UCSC Office of Research, courtesy of Vice Chancellor of Research Scott Brandt, who was, unfortunately, unable to attend. Technology management lecturer John Skardon, from whose entrepreneurship classes most of the competitors came, presented Deigel with the second place check. She plans to use her prize money to launch the non-profit CareCuts, a safe voucher and online method for bringing homeless shelter residents to local salons for haircuts and styling to help them re-enter the workforce. Third Place ($2,000): Code Naturally by Sukhmeet Singh (B.S. technology and information management, 2015), Asher Gardner (B.A. philosophy, 2015), and Justin Blair (B.A. Film and Digital Media, 2016). The third place award was sponsored by the following Scotts Valley businesses: Ideas Siero Labs, artists.com, and Business With Pleasure, all owned by Marcelo Siero, a Ph.D. student in computer engineering. Siero was on hand to present Code Naturally with their check. He also donated $2,000 worth of printing services for this event: the four giant checks themselves, as well as programs, name tags, and sets of 100 business cards for several students for their businesses. Code Naturally is a software application for the Microsoft Surface for recognizing handwritten code, compiling it, and executing it on the other half of the Surface screen. The Code Naturally team was mentored by Microsoft general manager of U.S. startups Jim Brisimitzis. People's Choice Award ($1,000): NuuJack by Zach Boelsterli (B.A. business management economics, 2015) and Spencer Butterfield (B.S. computer science: game design, 2017). The People's Choice Award was sponsored by King & Spalding Law Firm and by Laura Bushnell of King & Spalding, who is a UCSC Foundation Trustee and a member of the Baskin School of Engineering Dean's Advisory Council. On hand to present the People's Choice Award check to Boelsterli and Butterfield was King & Spalding Associate and patent attorney Stephen Abreu (B.S. biochemistry and molecular biology, 1999; M.S. molecular biology, 2003) of the San Francisco Office. NuuJack will soon be a patented universal electrical jack for mobile phones, tablets, amplifiers, and other electronic devices. Speakers at the event included Brent Haddad, director of the Center for Entrepreneurship, who gave the welcome address, and Brandon Allgood (Ph.D. computational physics, 2005, and a UCSC Foundation Trustee), who gave a keynote address, "Scientific Entrepreneurship: Rationally Irrational." Two winners from previous years, Dustin Gargas (B.A. economics, 2013) and Tom Beckett (B.A. history, 2013), also gave testimonials about their subsequent entrepreneurial activity.